Up until the age of 21 there was a plan. My parents reassured me I could veer, swerve, wiggle or jump ship at any time, but I felt confident in the plan. Go to school, find a passion, do well, make friends, form a next plan. All part & parcel of the plan. It was definite, and solid. The last couple of weeks I’ve felt on edge, with a hint of nausea lurking behind everything I do. The familiar flutter in my stomach, the elevated heart rate, the deep breaths that trip in my throat & fight their way down. Anxiety has come back to town. As of right now, there’s no plan. For the past two months I have been dismantling & reconstructing the things that were comfortable and solid in my life. The people and routines changed entirely, from the cup my toothbrush sits in to the arms I run to when anxiety roosts. I take it for granted that there’s some larger vague outline—move around, explore the world, find a job and life that mean something, succeed—but I’m terrified that that’s not the plan at all. The Boy I Love didn’t think our futures fit together, so what does it mean if I was wrong all along about what that future was? 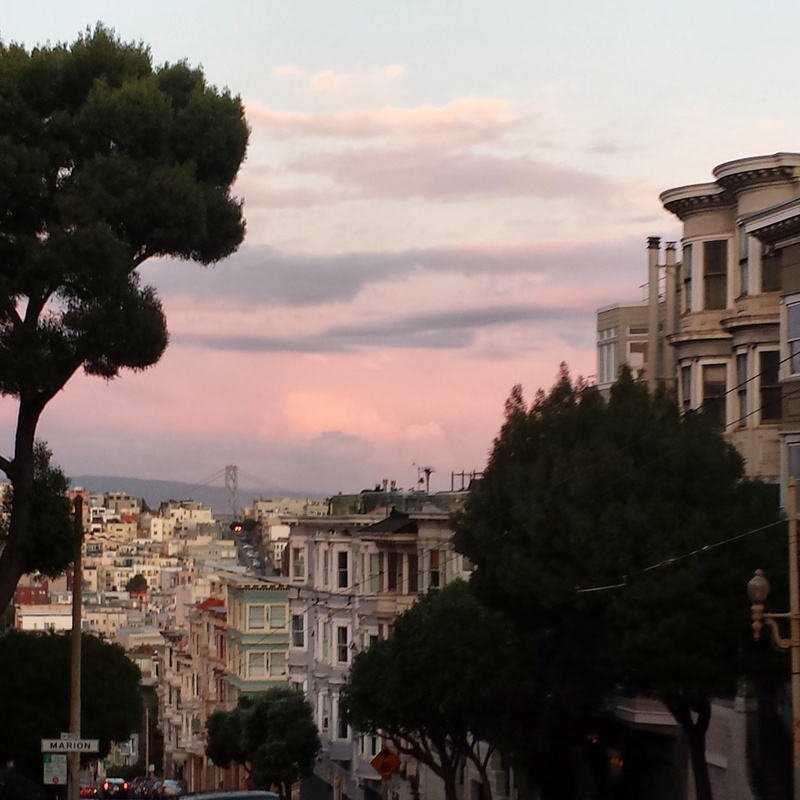 What if it’s supposed to be stay put, settle down, grow old in San Francisco? What if, as it so likely will be, the next thing is something I haven’t even dreamed up yet, and to kill time I’m playing roulette? My plans suddenly look so much more like maybes. So now I’m afloat in a lonely city with no plan. The current definites? Keep up at work. Keep forcing myself to the gym. Keep my room clean. Keep writing, keep cooking, keep drawing. Keep on with the things that keep the anxiety from stalking through my guts, and keep close to the people who understand what that means. Keep myself sane. Because sooner or later, my definites will turn to maybes, and my plans will turn to what ifs. And then what’s the plan? 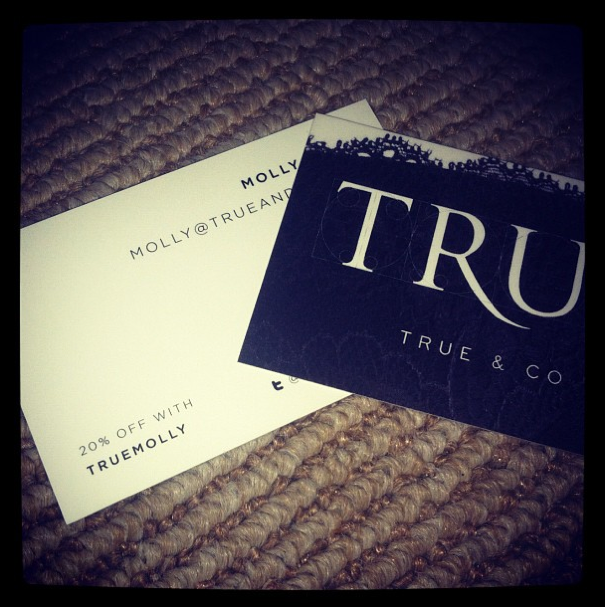 Ugh, that Molly. She’s the worst. She started a blog and then disappeared for two weeks with no good excuse. No but for serious, I owe a life update at the very least. The past however-long-its-been has consisted of bras, emails, phone calls, homelessness, business cards, podcasts, music (of the Folk Variety–get at me Hardly Strictly Bluegrass), Craigslist, a stomach bug, and a cooking extravaganza. I’ve been busy working (bras, emails, phone calls, business cards), and it’s awesome being actually busy during the days. I wake up, listen to some NPR on the way in (podcasts), and don’t think about my own personal life until the end of the day. After 22 years of never really getting a break from my own life, it’s kind of nice. The only problem with that is that it leaves me with very little desire to come home and pimp myself out to people with rooms to rent (Craigslist, homelessness). It’s been a good month and a half here now and I’m no closer to having a place to live, which is frustrating on a good day and rip-your-hair-out anxiety-inducing on a bad day. Luckily I’ve still had time to do fun things with the boyf (brunch, music), and have still had time to vom my brains out due to the aforementioned stomach bug. Nothing like a Saturday night of Arrested Development and head-in-toilet. I bet you so regret reading my blog right about now. That said, I will have more updates to come, from my favorite current idea for a Halloween costume (get back off the edge of your seats everyone) to the bake-stravo-ganza I had last night (I SAID SIT BACK DOWN, YOU CAN’T HANDLE MY EXCITING LIFE). I leave you with proof of my life as a semi-real person: a business card. I have written at least 15 different first sentences for this post. Why? Because I’m in a funk. It’s 3:00* on Thursday and I find myself in a cover-letter induced, can’t form a sentence funk. I think one of the hardest parts of the whole process is remaining positive. There’s such a “don’t worry, be happy… or else” mentality about everything. People seem to get genuinely uncomfortable with natural expressions of doubt, sadness and anxiety. Well let me be the first to say I have a whole lot of doubt, sadness and anxiety, and I refuse to apologize for it. It feels like I’m walking down a long hallway full of people ready to ignore me. Non-response after non-response after non-response. On top of that I feel like any break I take infects people with the notion that I’m kicking back and relaxing, that I don’t have a job because I’m not trying hard enough or I don’t want it bad enough. Tied into the positivity push is the notion that you can never do too much. And while there’s truth to that, rejection as a full time job is just too overwhelming. I’d be in entertainment if I wanted that as my career. So, needless to say, staring at a blank screen and trying to write about why I’m the most stupendous employable person who will bring so much to the table it’ll knock your socks off is not high on my list of Things I Want To Be Doing. Cover letter funk indeed. If you’re like me and you find yourself in a cover letter funk, step back from what you’re doing to do something you enjoy. I like to take a walk, watch a show or cook (I’m a stress baker). Additionally, I recently got great advice from a woman I met with in California: make it fun. For every 50 serious jobs you apply to, she recommended, send out 1 outrageous cover letter or apply to one absurd job. Perfect advice. *Evidence of the Funk? I did indeed start this post at 3:00 and didn’t post it until now because I was distracted, doing other things, forgot it for a bit. This is later than I usually post, but I’ve been a little all over the place today, so bear with me. 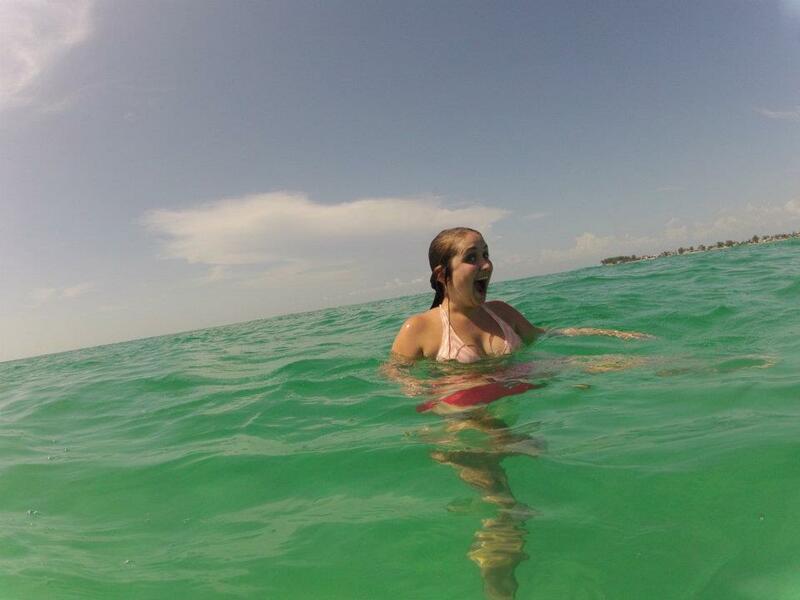 I spent America’s birthday in Florida enjoying the sun and getting myself a nice little sunburn across my whole back. It was great to get away from Providence for a little bit, spend time with Patrick, and do as few real life tasks as possible. 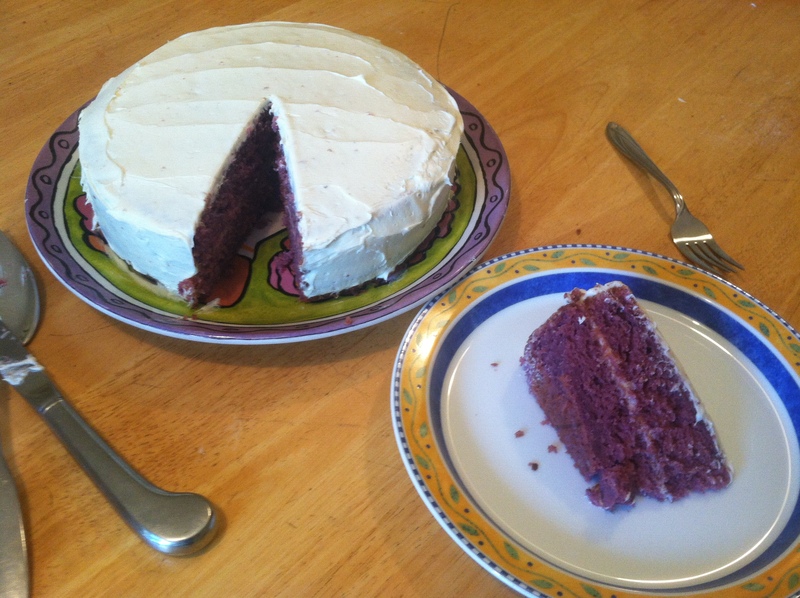 While traveling I spent a lot of time on Food Gawker and came across this recipe for Blackberries and Cream Cake. I was sold, I knew I had to try making this cake. I altered it a little bit, using raspberries as well as blackberries, although I suspect you could use any kind of berries and it would be great. 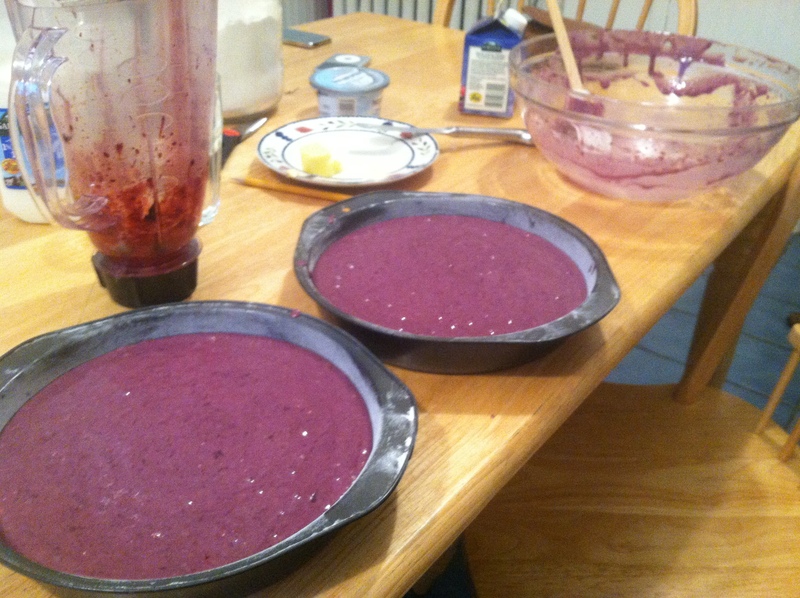 The batter was this awesome color of purple; I can’t remember the last time my kitchen was this colorful. The biggest issue I ran into was with the frosting. I tried the recipe from The Cake Merchant post but I found that it never came to stiff peaks. I whipped and whipped the frosting but only ever got it to soft peaks, so it wasn’t really firm enough for me to frost with. I was disappointed, because it tasted amazing. 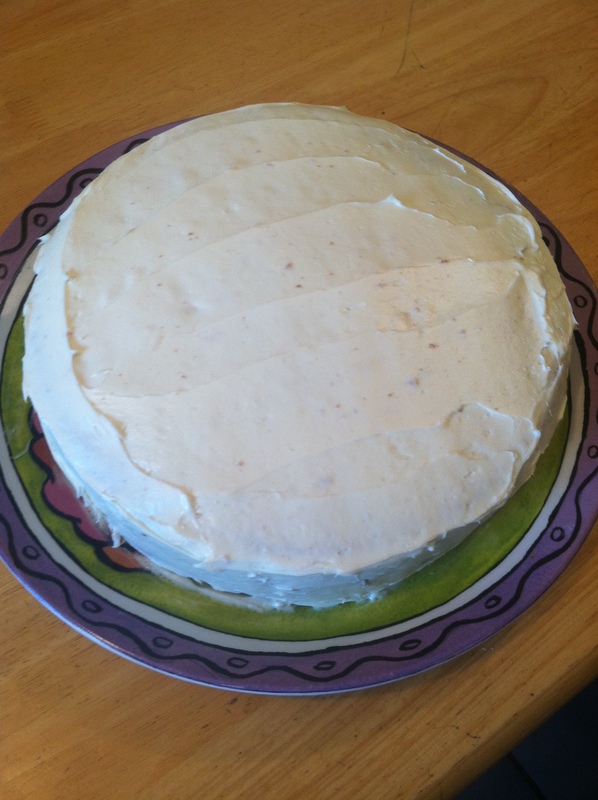 I still managed to use it in between the layers, and I was glad I did because it added to the moistness of the cake and wasn’t as sweet as other frosting. 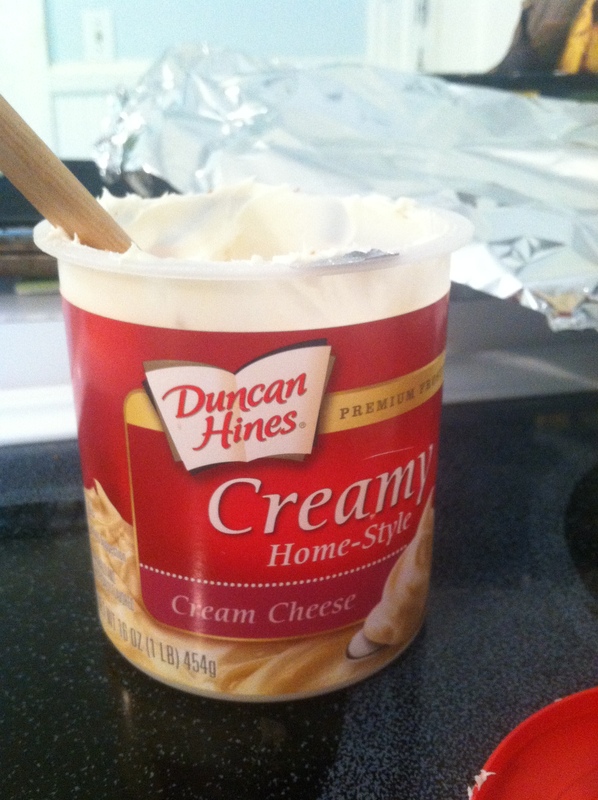 In the end I had to settle for a tub of Duncan Hines Cream Cheese frosting. I’m certainly not a master decorator and have no time or patience to do a crumb coat when I frost. That said, my cake didn’t turn out too shabby. I wish I’d saved fresh berries to put around the edges but I used mine all in the cake, and it was so delicious I wouldn’t change a thing. I’d recommend this recipe to anyone looking for a super easy summer cake. It turned out absolutely delicious. I’ll keep experimenting with the frosting, because in theory I liked that it was light and not excessively sweet. I also think I’d try a frosting with a bit of citrus. Preheat the oven to 350 degrees F. Flour, grease and parchment line two 8-inch cake pans. Puree the blackberries and raspberries. If you don’t want seeds in your cake, strain the puree. 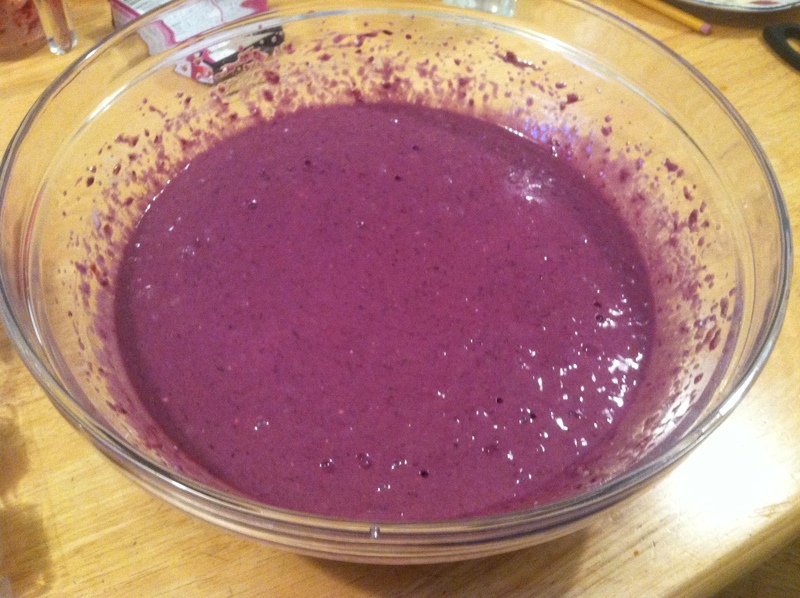 Place all ingredients in a large bowl and mix on low until all ingredients are just incorporated. Increase the speed to medium and beat for an additional 1 1/2 minutes. Divide the cake batter between the two pans. Bake for 25-30 minutes. Cake is done when a toothpick inserted into the center comes out clean. Let the cakes cool, run a knife along the edges and invert the cakes onto wire racks. The frosting is up to you, but I can wholeheartedly endorse my boy Duncan–he will not fail you. 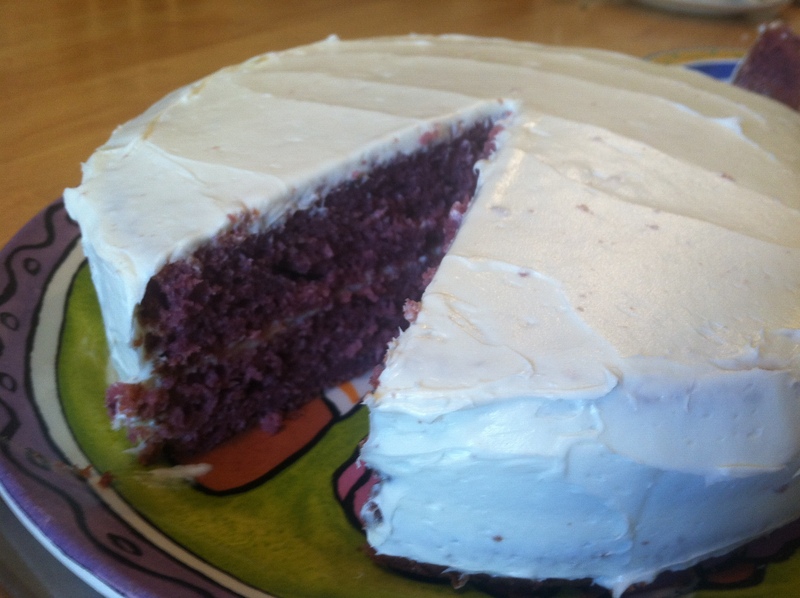 For better frosting and assemblage directions than I can give, check out the Cake Merchant original post. Anyone got any other great summer cakes or desserts I can try? Rainy Mondays are starting to become a trend. This Monday, however, I managed to get out of the house before the torrential downpour started, trapping me in Starbucks with nothing to do but work. The forced productivity is a bit of a blessing in disguise since my weekend trip to Maine drained me of all desire to work. I sat there staring out at the pond thinking if all else fails I can just go live in the cabin until my money runs out. And let me tell you, that’s a pretty great sounding backup plan. Instead I’m trying to channel the frust-rage-tion (you heard it here first–it’s the new “frindle”) into working out and eating healthier. It’s been on my To Do list for a couple years now (*cough*freshmanfifteen*cough*) but I knew I wouldn’t ever really do anything about it until I graduated. Let’s be honest, college is really the only time in your life when you can order wings and a calzone, watch 10 hours of Restaurant Impossible and call it all a “hangover cure,” so clearly I was going to capitalize on that. Eat Yourself Skinny: Kelly at Eat Yourself Skinny always posts recipes that look and taste incredible despite the fact that they’re often “skinny” versions of recipes. I can’t help drooling over her recipes, even the simpler ones like this grilled honey-orange chicken salad. It doesn’t hurt that she’s funny, posts links to other great blogs, and includes dessert recipes which is pretty much a must for me, since I’m just self-aware enough to know that I’ll never give up my sweet tooth. Skinnytaste.com: The recipes that Gina posts always look good and often get me to try new ingredients and flavor profiles. Her asian mango slaw has made it into my regular rotation, and I’ve always got at least one of her recipes on my “Try It Soon” list. Next up? I’m definitely going to make this salad for lunch some day this week. Fit Fab Cities: I mostly use this blog for the printable workouts and workout playlists. But I initially was drawn to Fit Fab Cities because of blogger Caitlin’s stance on being fit: “I’m not one of those girls who can survive on lean protein and steamed veggies alone. I love a great cheese pizza and given my devotion to chocolate chip cookies I have a feeling watching Cookie Monster as a kid had a profound effect on me.” Amen sister. With that, I’ll stop writing about being productive and get to it. That cover letter isn’t going to finish itself, even though I’m literally sitting here willing it to be done. On second thought, the sun is coming out, and I’ve got a kindle book that’s dying to be read..
‘Cause instagram makes everything look better.. I wanted mess? I got it. What started as a simple quest to find my colored pencils ended in the realization that my life is, quite literally, a mess. Not that this is a surprise to those who know me, but the mess has reached an unbearable level. My clothes are all in garbage bags, my things are in boxes and bags, and I’m living out of a suitcase. Half my stuff is still in the garage and I just found out some of my boxes are soaking wet. I keep picturing bugs making their way into the bags of clothes and then having to put my entire wardrobe in the laundry. I hate laundry. So I set out on a mission: today, I will conquer the mess. My hope is this can be a “before” post, and that by tomorrow I’ll have all my summer clothes sorted from my winter clothes (packed back in bags and boxes), and that I’ll have some sort of system for finding my things. This is complicated by the fact that I don’t want to completely unpack everything, but I’m a resourceful girl. I will find a place for all my books! I will find a spot for my banjo and my art supplies! I miiiight find a place for my shoes (I’m a realist–I got a lot of shoes). Updates on my progress to come. I know you’ll be sitting on the edge of your seat.